Dr Ravindra Ranasinha, Drama-Therapist and Sociologist from Sri Lanka during a Drama-Therapy session orgnised by Friends of Tibet in association with Buddha Gandhi Marg Trust and World Dramatics Study Centre & Film Institute organise Drama-Therapy Session with Dr Ravindra Ranasinha from Sri Lanka at Mannom Vidyaniketan School, Pathirappalli, Alappuzha on August 12, 2017. 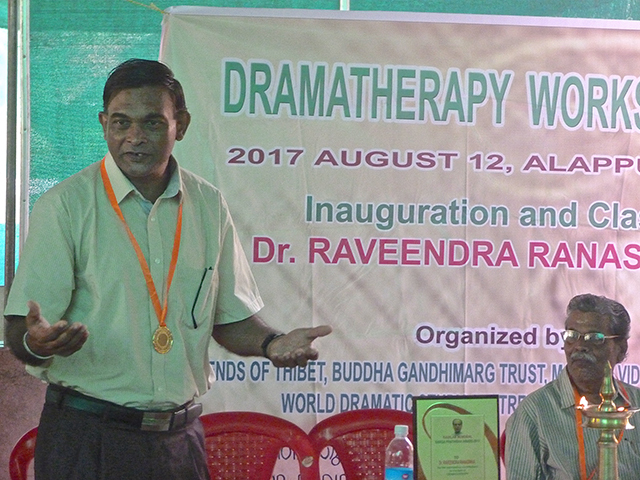 Friends of Tibet in association with Buddha Gandhi Marg Trust and World Dramatics Study Centre & Film Institute organise Drama-Therapy Session with Dr Ravindra Ranasinha from Sri Lanka at Mannom Vidyaniketan School, Pathirappalli, Alappuzha on August 12, 2017. Alappuzha, Kerala: Dr Ravindra Ranasinha is a world renowned Social Activist, reformer and educationist from Sri Lanka, who has pioneered the use of Drama-Therapy for treating Post War Traumatic Stress among the people of Sri Lanka. But his interaction with the children of NSS CBSE School was about fun and enjoyment. It was a surprise visit and the children did not hesitate to join in all the activities he had planned for them. Among the many things he taught the children was learning how to express themselves confidently. 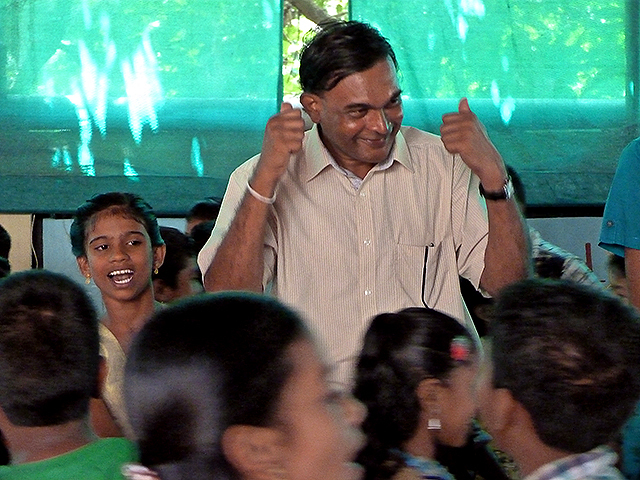 Armed with a huge repertoire of fun-filled techniques and activities usually reserved for theatre training, Dr Ravindra showcased his mastery over teaching children important life lessons such as positive self-image, creative thinking and positive self-expression through drama-therapy. The adults who watched from outside were amazed to see the tremendous response and engagement from the children. Even Dr Ravindra was a bit awed by the lack of inhibition shown by the children as they wholeheartedly participated in his activities. The inauguration of the event was attended by eminent dignitaries such as K Haridas, Principal, Mannom Vidyaniketan School; Padmakumar, Social Activist; Sylvie Bantle, German Writer-Activist; Aryaad Bhargavan, Director, World Dramatic Study Centre and Film Institute, Alappuzha and Arun Subramanium, Founder, Buddha Gandhi Marg Trust and several teachers of the school. K Haridas spoke vividly about how the education system fails to harness the creative energies of children in a positive manner and what a wonderful opportunity it was to have the talented Dr Ravindra train them. Aryaad Bhargavan talked about how this event showcases that the field of drama can contribute to the society in the modern times. During the concluding session, the children themselves took the initiative to thank Dr Ravindra and to express the positive influence the event had on them. Last but not the least Dr Ravindra Ranasinha was presented with 'Kavalam Narayana Panikker Award' for his outstanding contribution to the field of Drama-Therapy by Aryad Bhargaven, Director, World Dramatic Study Centre & Film Institute, Alappuzha. Dr Ravindra Ranasinha, being presented with 'Kavalam Narayana Panikker Award' for his outstanding contribution to the field of Drama-Therapy by Aryad Bhargaven, Director, World Dramatic Study Centre & Film Institute, Alappuzha. 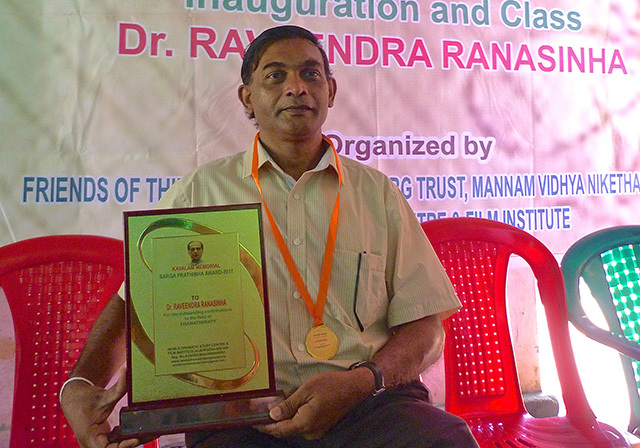 Dr Ravindra Ranasinha is a dramatist, journalist, sociologist, educationist and a social worker from Sri Lanka. He writes profusely on the Fascist developments in his country. He focuses on the devastating Fascist attacks against the multi-religious and multi-ethnic social structure in Sri Lanka. His several essays clearly indicate how the media is responsible for shaping the mind-set of the people in the current Sri Lankan political scenario. Dr Ravindra's thinking is highly influenced by the Frankfurt School, and especially by the writings of Walter Benjamin. His special interest on Neo-Marxism is reflected through his Sinhala translations of Walter Benjamin's lectures 'Author as Producer' and 'Art in the Age of Mechanical Reproduction'. As a veteran in the field of drama has done in-depth research towards drama's therapeutic strength to heal the psychologically and emotionally wounded people. His research study enabled him to introduce drama-therapy to Sri Lanka as a viable creative healing process. His book 'Dramatherapy in Sri Lanka' elaborates this amazing strength of drama to promote psychological, emotional and social well-being. Dr Ravindra holds a PhD in Dramatherapy. Dr Ravindra has recently published a book on the lacunas in the Sri Lankan educational system — which he marks with a Grade F. In this new book, 'How Schools Abuse and Fail Children: Dramatherapy to Heal Emotionally Traumatized School Children in Sri Lanka', every aspect from physical to sexual and emotional abuse, to romantic adolescent crushes and suicides, mental health, home violence and broken families are dealt with comprehensively. This book is well compiled with arduous research and fortified with several case studies that clearly sound out the dangerous psychological perspectives of such enforced trauma.